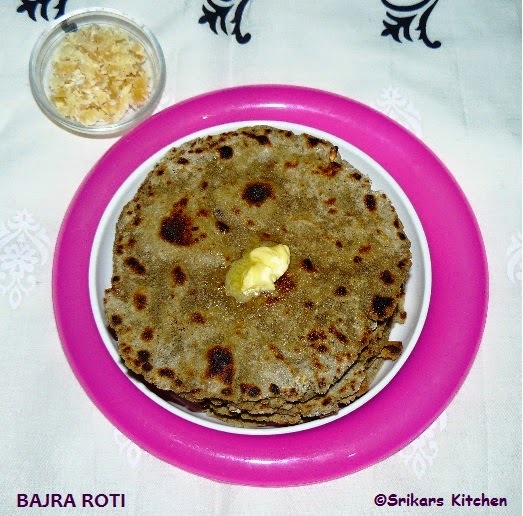 Bajra roti is very healthy dish & my favorite roti. I had this roti first time one of the famous restaurant at Wembley,London.That time I dont know which is best combination of this roti. I asked the chef about that, he told me ghee/butter and jaggery is the best combination . I made this roti first time ,It came out really well. First I tried to make this roti using the rolling pin. But it didn't work out as the shape and inconsistent texture . If you making big size roti, you need a proper experience. So i made small proper rotis. Take a bowl, add bajra flour,salt & mix well. Add warm water slowly & mix well. (adding water is very important). Make a soft dough & keep it aside for 15 mins for resting. Heat the tawa, add the flattened bajra roti, cook it both sides with little ghee. Serve with butter & jaggery.